Connect high school students with the research community. 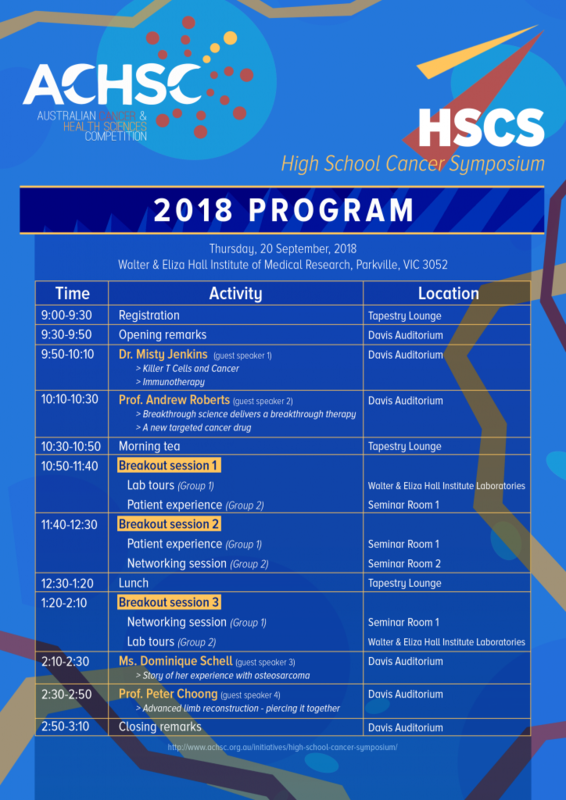 In 2018, the HSCS will be held on Thursday, 20 September at the Walter and Eliza Hall Institute of Medical Research. In 2018, registration for the High School Cancer Symposium will also include registration for the High School Cancer Competition. The Symposium will be held on Thursday, 20 September 2018 at the Walter and Eliza Hall Institute of Medical Research. The Competition will be held on Friday, 21 September 2018 at each participating school. If you are a year 10 student, please contact your science teachers to register for this year’s Symposium. Spots are strictly limited, so register as soon as you can! Further information for students is available below. If your school would like to register for the HSCS and HSCC together, please register using the HSCC and HSCC Combined Registration Form. HSCS and HSCC combined registration closes Wednesday, 29 August 2018 or when the Symposium reaches capacity. If this occurs, we still encourage all interested students and teachers to register for the HSCC using the HSCC only registration option below. The ACHSC also kindly reminds teachers to ensure that all relevant forms are submitted during registration; only complete applications will be accepted due to logistical reasons. Please contact registration@achsc.org.au if your school has more than 5 interested students; we may be able to accommodate larger groups. If your school wishes to participate in the High School Cancer Competition only, please register using the HSCC Only Registration Form. More information on the HSCC is available on the High School Cancer Competition page. HSCC only registration closes Wednesday, 29 August 2018. 2018 HSCS Media Release Form (must be completed by all attending students and teachers). For further information, or any other enquiries, please contact the ACHSC at info@achsc.org.au.